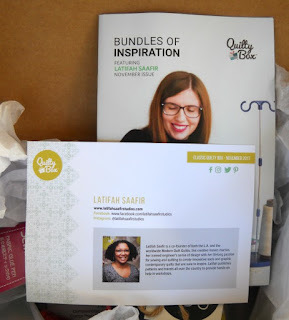 The November Quilty Box featured designer is Latifa Saafir. 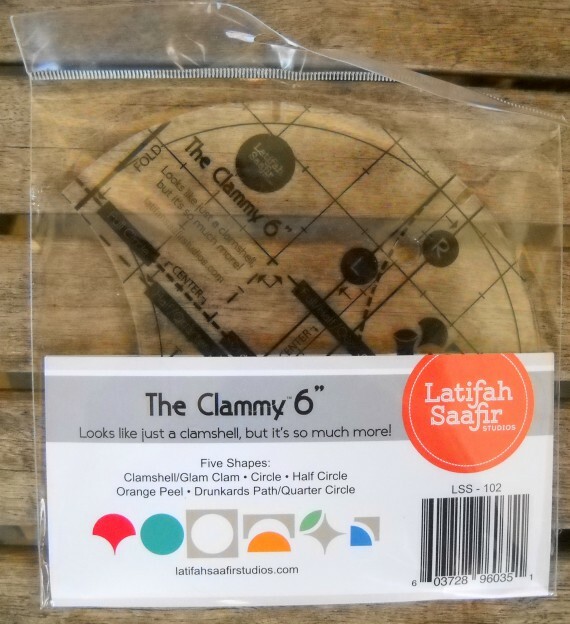 There is a short interview with Latifa. 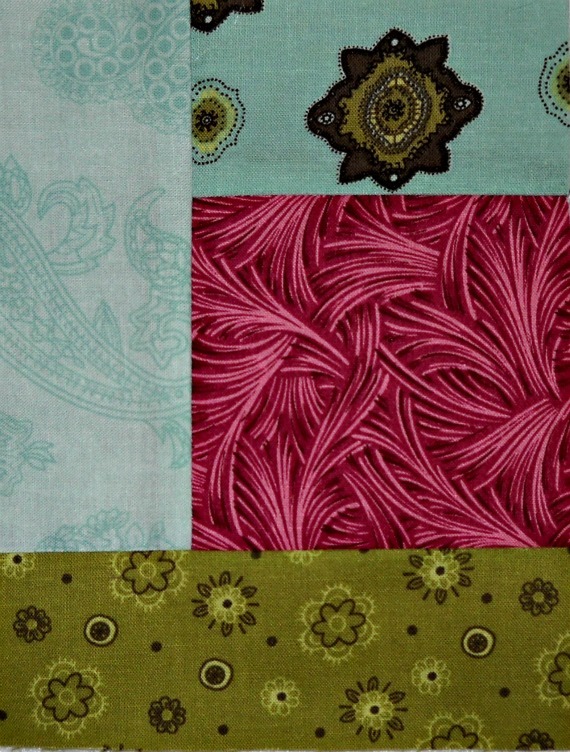 She is inspired by tessellations, and has included a pattern to make a modern style "Slap Bracelet" quilt. Also included is this fabulous eight piece fat quarter bundle of Me and You from Hoffman Fabrics ~ Hooray! We all love fabric, don't we? Here is Latifah's own Clammy 6" tool. This is used in her included pattern, and can also be used to make many different curvy block variations. The Sewline Fabric Glue Pen. I'm thinking hand applique without pins....can't wait to try this out! 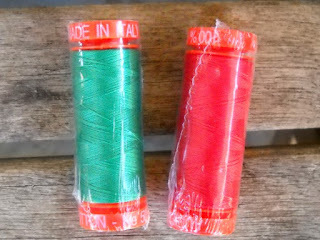 Red and Green threads from Aurifil. These have me thinking "Christmas!" 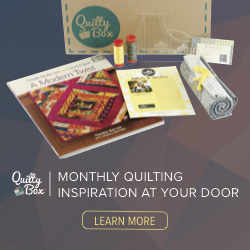 Click the above ad to visit Quilty Box now and sign up for the December Box. 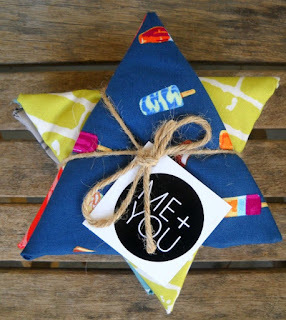 Five percent of profits from multi-month subscriptions goes to Quilts for Kids, a non-profit that provides quilts for children in need. For each issue of Quiltmaker's 100 Blocks, Quiltmaker sends a little thank you gift to the designers and block testers. In the past they've sent big buttons, mugs, mouse pads, aprons, and tote bags. This time it's a calendar. 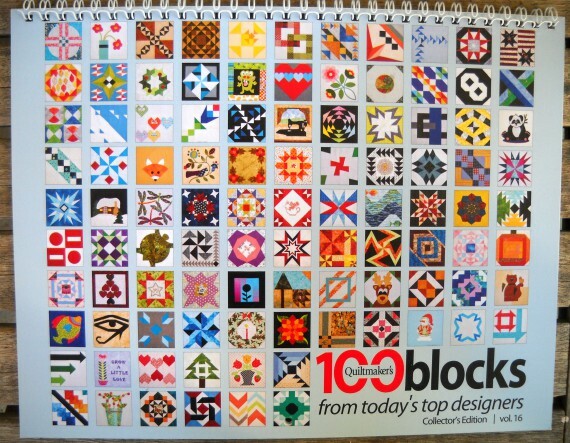 The cover has a wonderful photo of all 100 blocks ~ isn't that fun? Whoever put together the months did a really nice job. 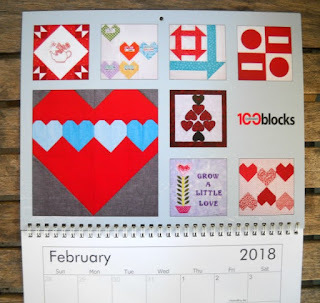 Each month features a block theme that coordinates with that time of the year. My "Grow a Little Love" block is featured in February, along with a bevy of Valentine and red blocks. So sweet! 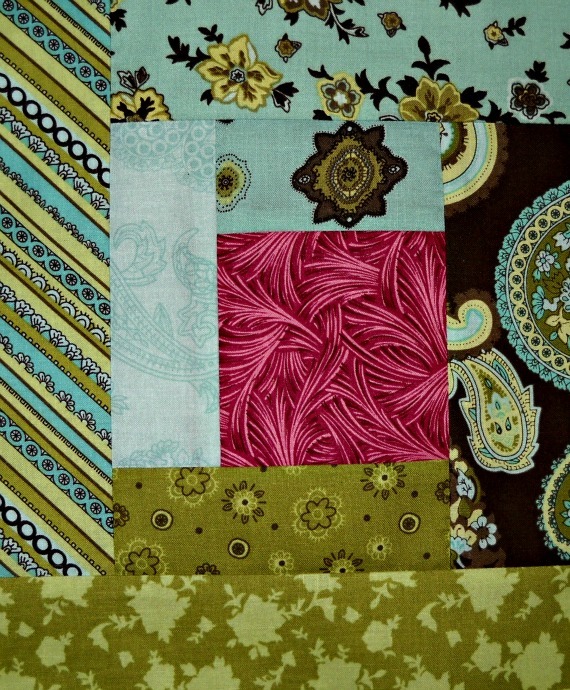 You could sew all of these blocks into a special Valentines quilt for a special someone. 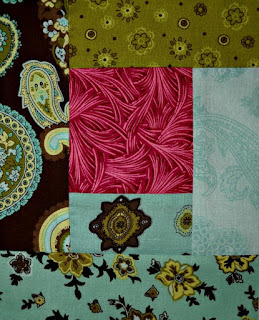 Quiltmaker's 100 Blocks Road Rally Blog Tour Winner! Congratulations go out to Maryellen in Franklin Square, New York! She is the winner from my segment of the Road Rally blog tour. She commented "Sweet block. I do love roses." We love roses too, Maryellen. 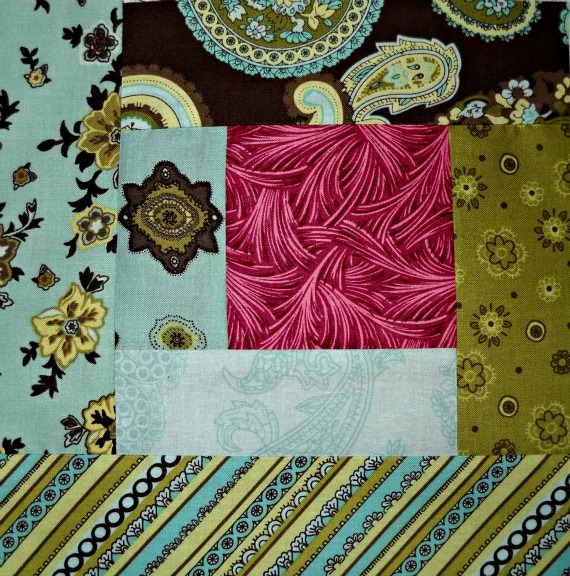 She will be receiving her very own copy of the new issue of Quiltmaker's 100 Blocks. Hooray, Maryellen! 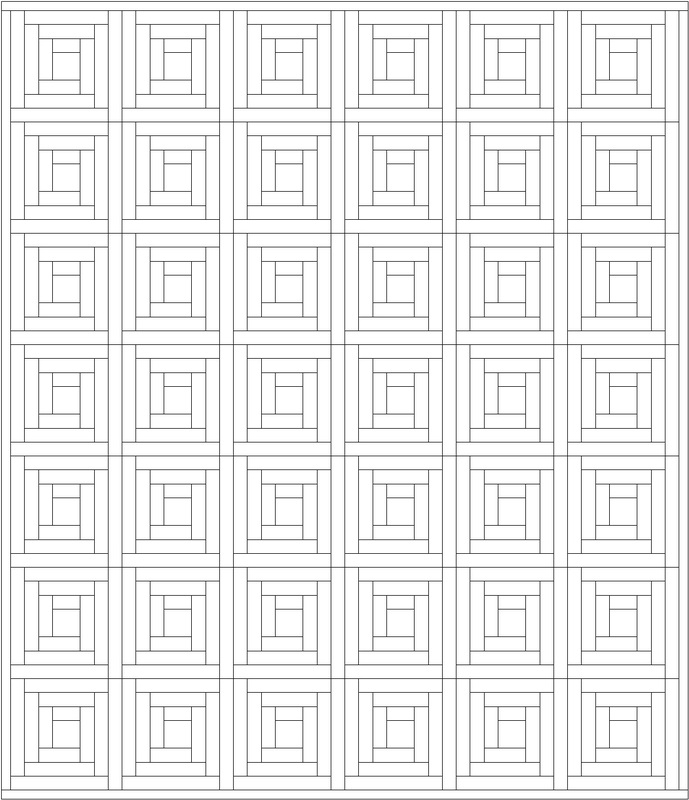 Enjoy your new block patterns! It's Small Business Saturday! Click here to visit the Curlicue Creations shop. 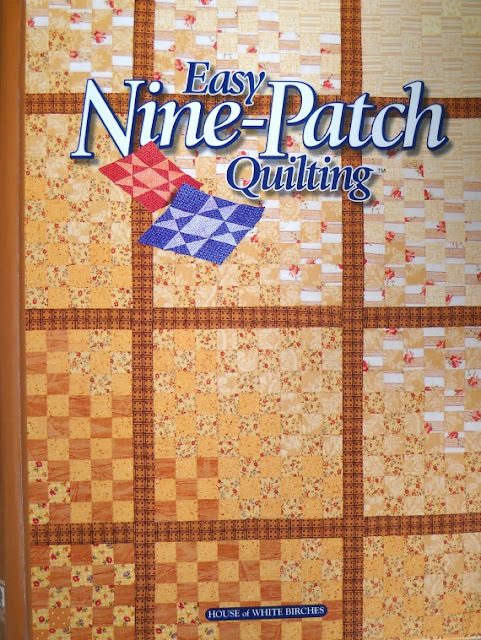 Easy Nine-Patch Quilting is an outstanding quilting book, by the popular quilt publisher, House of White Birches. This book is filled with techniques and tips regarding all aspects and styles of nine-patch quilting. This book is hardcover, in fair condition. Color photos and diagrams. 160 pages. Copyright 1998. This book includes a Nine-Patch Through the Years, Grandmother's Nine-Patch Favorites, Decorating with Nine-Patch, Glorious Nine-Patch Quilts, Contemporary Nine-Patch, General Instructions, and more. There is a lot of in depth information accompanied by helpful, step by step diagrams. 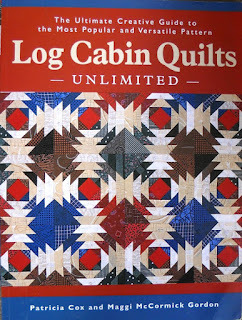 Log Cabin Quilts Unlimited is an outstanding quilting book, by the popular quilt artists Patricia Cox and Maggi McCormick Gordon. 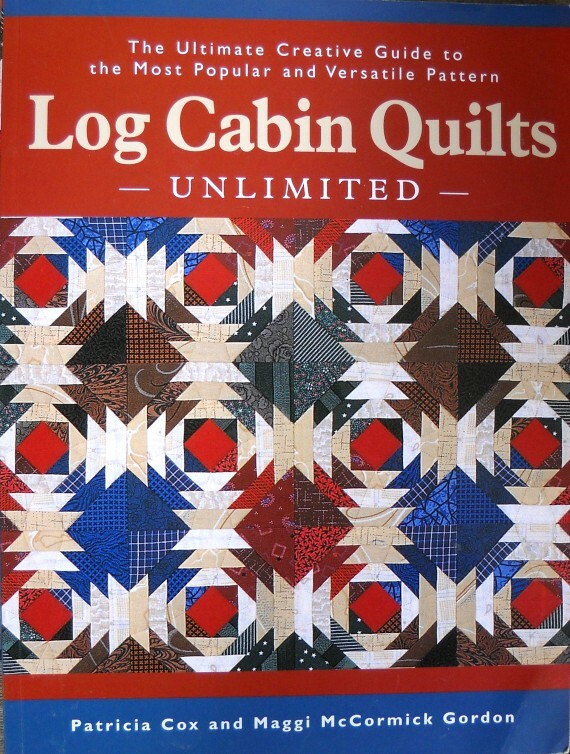 This book is filled with techniques and tips regarding all aspects and styles of log cabin quilting. This book is softcover, in very good condition. Color photos and black and white diagrams. 144 pages. Copyright 2004. 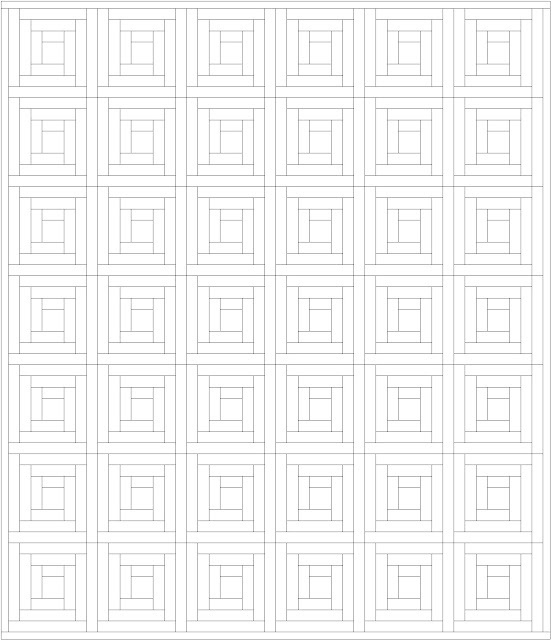 This book includes an Introduction, The Pattern that has Inspired for Generations, Block-Making Techniques, Block Variations, Setting Patterns, Workbook, an Index, Acknowledgments, and more. There is a lot of in depth information accompanied by helpful, step by step diagrams. 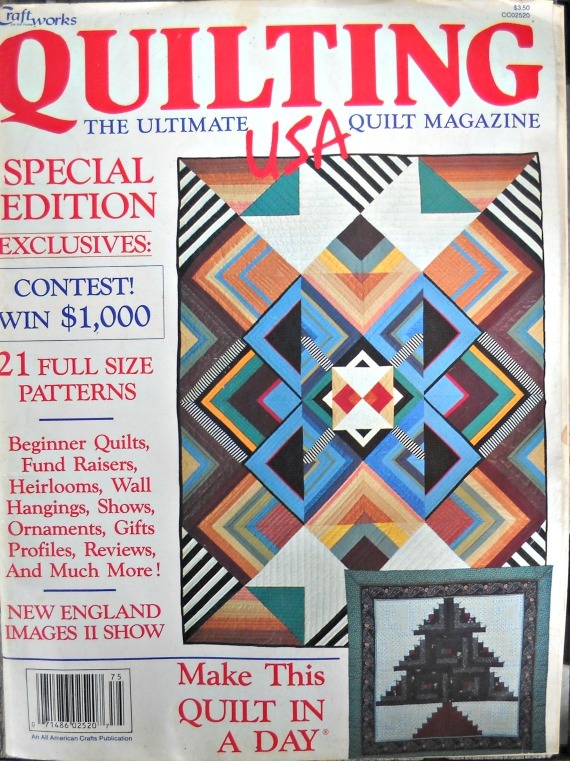 Quilting USA Magazine, the Feburary 1987 issue. 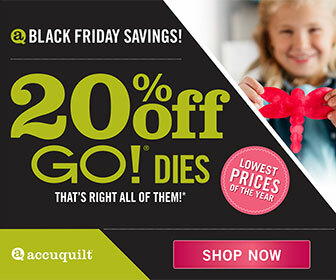 This magazine features Special Edition Exclusives, 21 Full Size Patterns, Beginner Quilts, Fund Raisers, Heirlooms, Wall Hangings, Shows, Ornaments, Gifts, Profiles, Reviews, New England Images II Show, Make this Quilt In a Day, and more. This fabulous issue of Quilting USA magazine is in used, but fair condition. 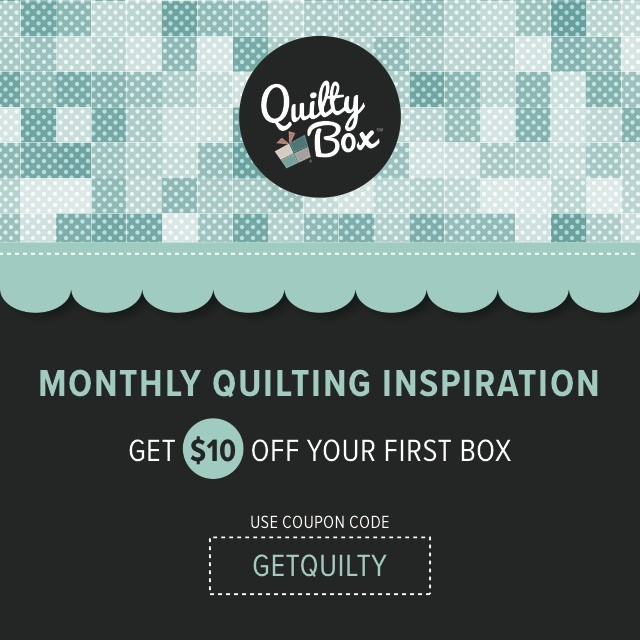 62 pages of great ideas for quilting. 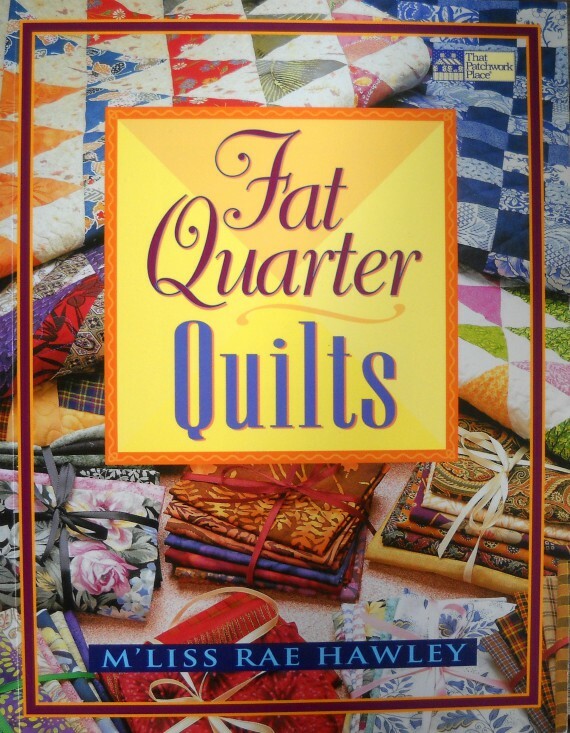 Fat Quarter Quilts is an outstanding quilting book, by the popular quilt artist M'Liss Rae Hawley. 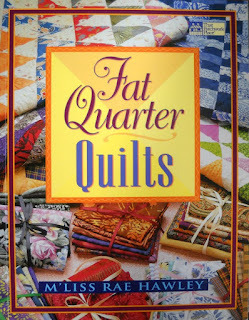 This book is filled with techniques and tips regarding all aspects of quilting, plus ten projects featuring fat quarters. This book is softcover, in very good condition. Color photos and black and white diagrams. 79 pages. Copyright 1999. *Note: A name is handwritten on the inside cover (see photo 10). This book includes an Introduction, General Instructions, Projects, Quilt Finishing, About the Author, and more. There is a lot of in depth information accompanied by helpful, step by step diagrams. For these fabulous quilt books and magazines and more, click here to visit the Curlicue Creations shop. New items are added weekly. 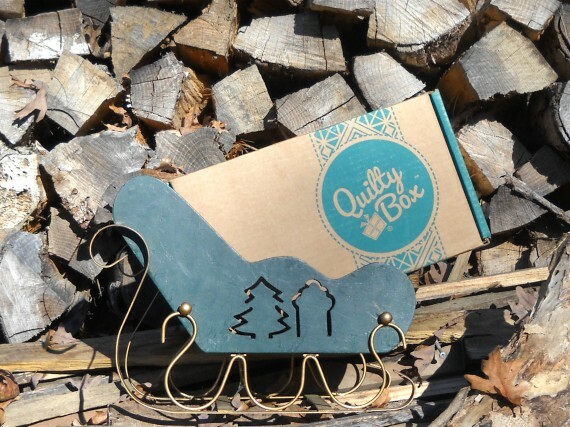 Hello, and welcome to the Log Cabin Quilt Block Classics tutorial. We'll be exploring the classic log cabin quilt block, learning a little about it's history, and sewing a 12" sample block. If you've been quilting for any time at all, you've probably seen or sewn a Log Cabin block. There are many, many versions of this block. Some are skinny, some are wonky, some are modern, but all originate from the classic Log Cabin block. 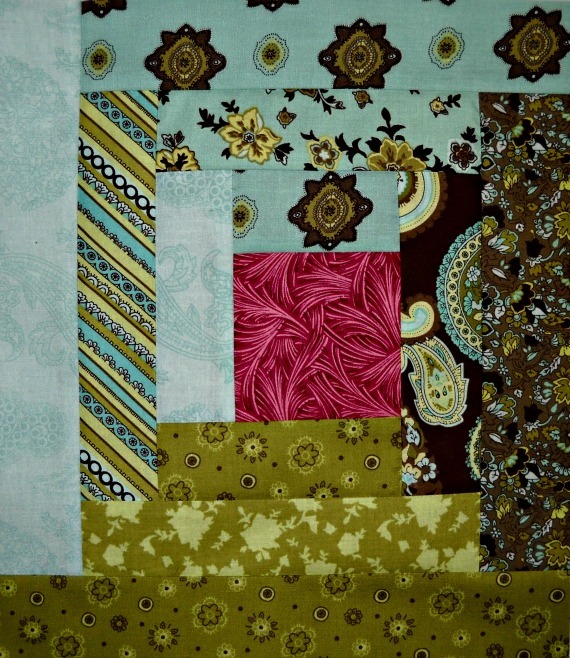 The Log Cabin block starts with a center square and builds out and around from the center with "logs" of fabric. The center square is traditionally red, to represent the hearth of the cabin. 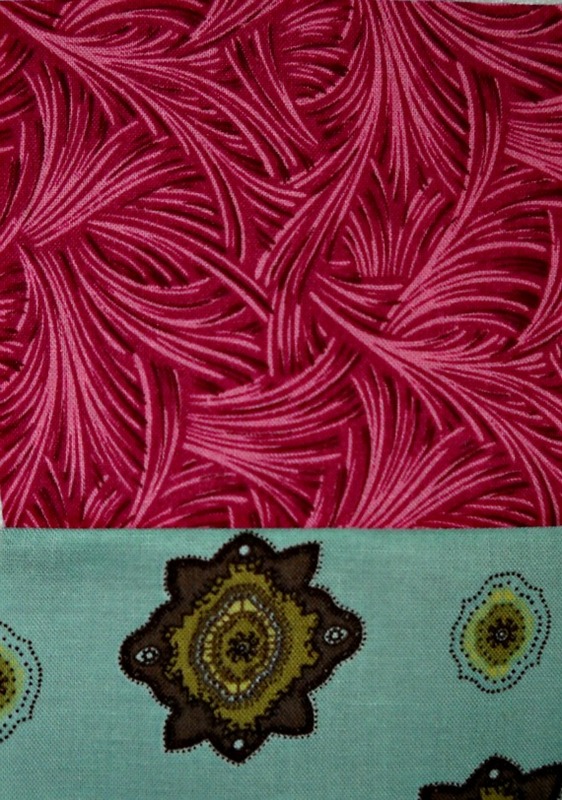 The block is normally constructed with one half of the fabrics in a dark value and the other half of the fabric in a light value, split diagonally, across the block. 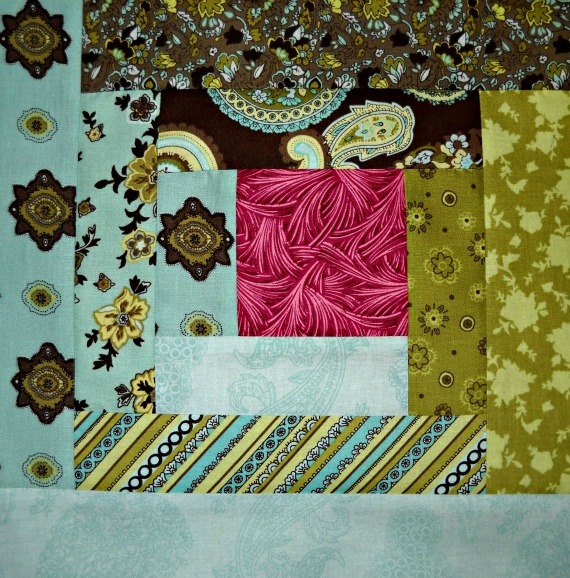 This allows the quilter to create a large variety of quilt patterns, all using the same, basic block. I'm not sure how "printable" this image is here, from the blog, but this is a Log Cabin coloring page using the same block layout we're sewing today. For more free and downloadable quilt coloring pages, sign up for my newsletter. There is a sign up form on the right hand side of my blog and also at the bottom of this post. Now, let's sew the Log Cabin block! 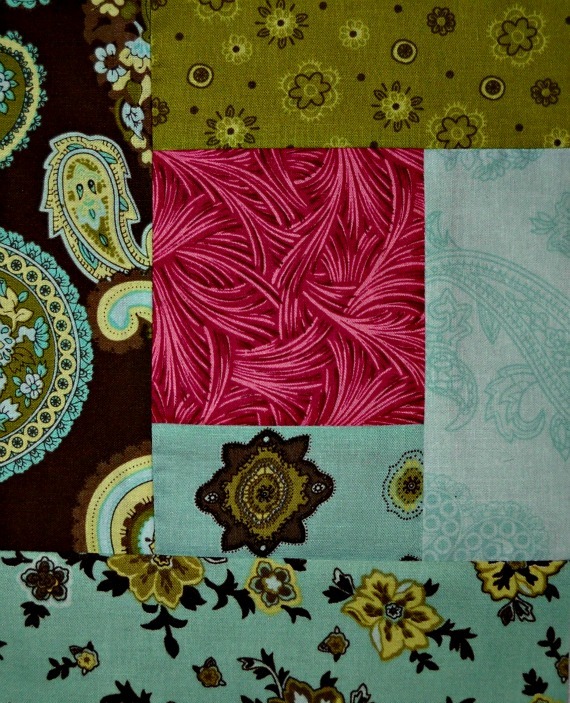 I went to my stash for the fabrics used in my block. 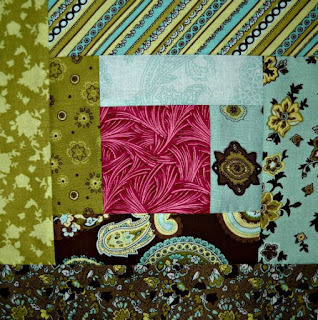 Log Cabin is an excellent stash busting scrap quilt block. 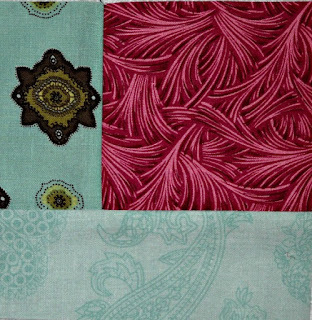 You will need a red or pink fabric for the center square, six light value fabrics, and six dark value fabrics. Sew one Light 2" x 3-1/2" strip B to the Red/Pink 3-1/2" x 3-1/2" square A. Turn the block a quarter turn, clockwise. Sew one Light 2" x 5" strip C to this side of the block. Turn the block a quarter turn, clockwise. Sew one Dark 2" x 5" strip C to this side of the block. Turn the block a quarter turn, clockwise. Sew one Dark 2" x 6-1/2" strip D to this side of the block. Turn the block a quarter turn, clockwise. Sew one Light 2" x 6-1/2" strip D to this side of the block. Turn the block a quarter turn, clockwise. Sew one Light 2" x 8" strip E to this side of the block. Turn the block a quarter turn, clockwise. Sew one Dark 2" x 8" strip E to this side of the block. Turn the block a quarter turn, clockwise. Sew one Dark 2" x 9-1/2" strip F to this side of the block. Turn the block a quarter turn, clockwise. Sew one Light 2" x 9-1/2" strip F to this side of the block. Turn the block a quarter turn, clockwise. Sew one Light 2" x 11" strip G to this side of the block. Turn the block a quarter turn, clockwise. Sew one Dark 2" x 11" strip G to this side of the block. Turn the block a quarter turn, clockwise. Sew one Dark 2" x 12-1/2" strip H to this side of the block. Your Log Cabin block is complete! Sew a few and play with them. Turn the blocks in different directions and see the beautiful results you can create with a few simple blocks. 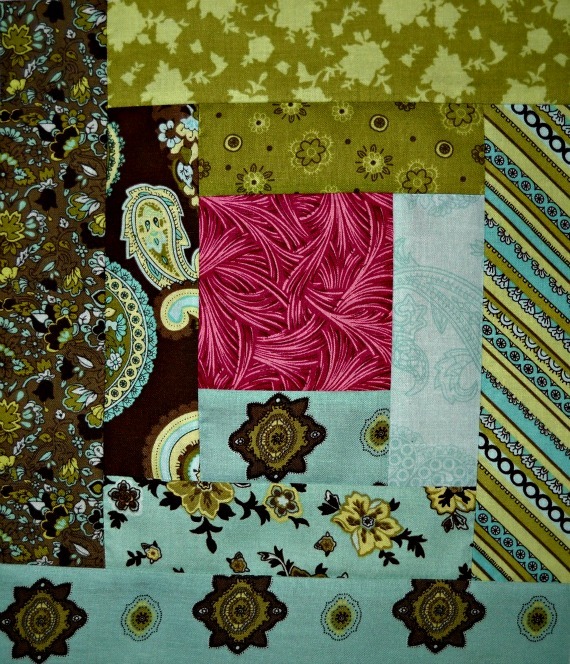 No, I'm not dancing and quilting at the same time. I'm nowhere near that coordinated! 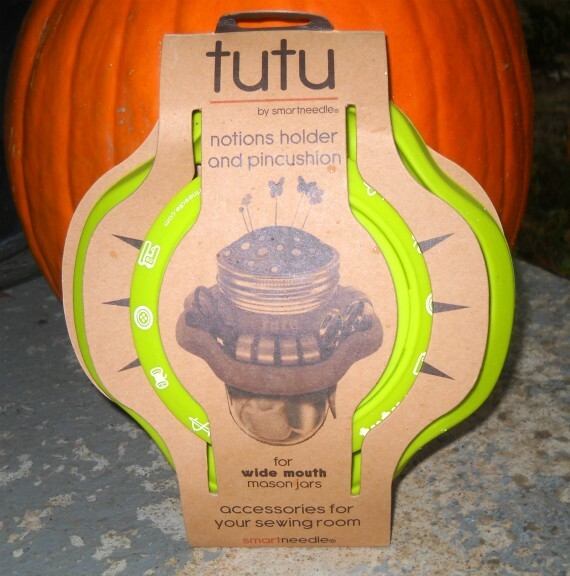 The sewing Tutu came in the October Quilty Box. I was excited to try it. It fits over the top of a wide mouth canning jar. What a cute idea! 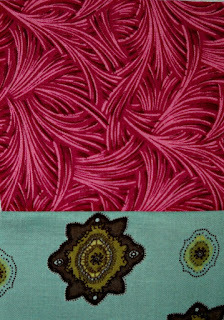 The pincushion top can be customized with the fabric of your choice. 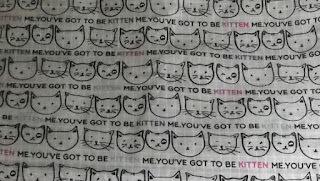 I've been waiting for the "purrfect" project to use my "You've got to be kitten me" fabric. This is it! 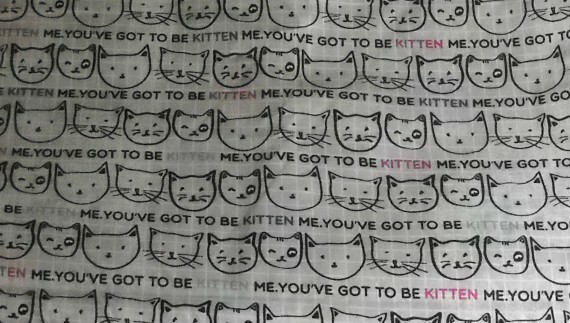 Meow. I tried a few different jars before I found the right one. 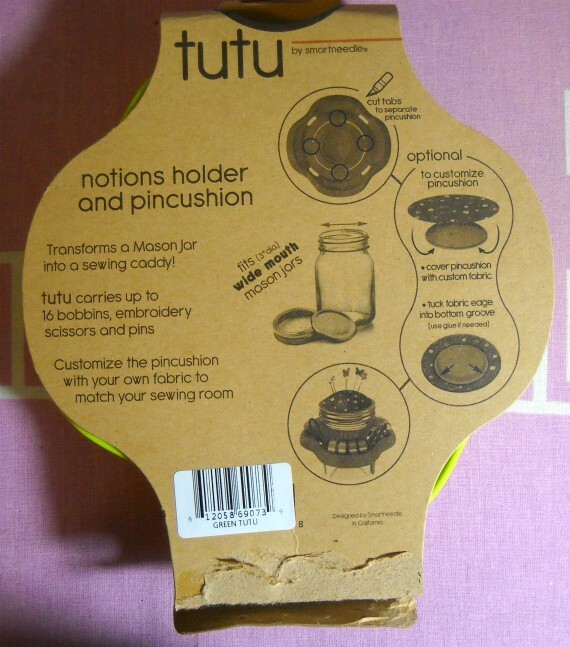 The jar needs to be wide mouth ~ and have shoulders, otherwise the tutu falls down. That could be embarrassing! 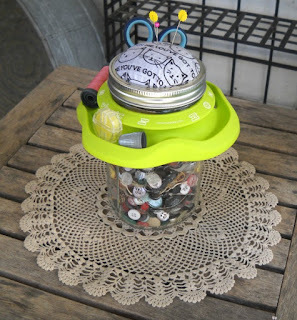 I filled my jar with a bunch of vintage buttons, but you could customize it with so many different possibilities. This is my result. I love it. Room for pins, needles, scissors, thread, thimble, etc. This is just right for my hand sewing tv nights. 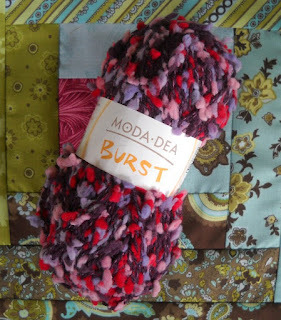 This was just one of the fun surprises in the October Quilty Box. 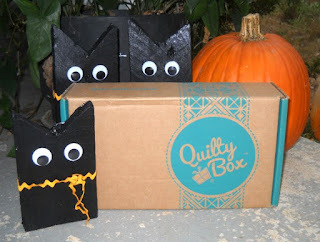 I just received my November Quilty Box this week. I'll show a peek into that package soon. If you want to try Quilty Box for yourself, or send one to a friend, just click on the advertisement at the end of this post. 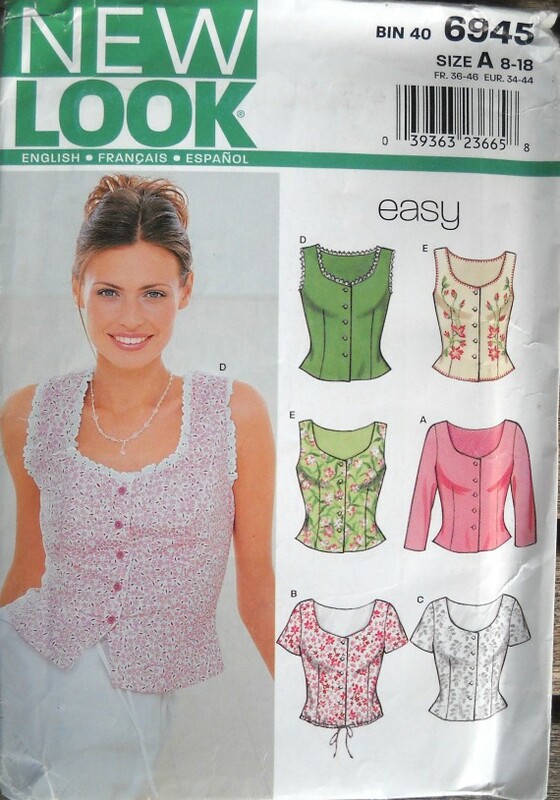 New Look Easy Tops pattern, sizes 8, 10, 12, 14, 16, and 18. 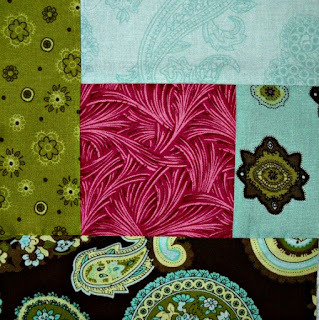 This pretty pattern makes a classic style top in six variations. Options for tops include sleeveless, short sleeves, long sleeves, neckline variations, drawstring or hemmed, and various trims and decorative stitching. Picture yourself wearing this lovely top to a special event, at the office, or even just out shopping. This outfit will inspire you to be confident, plus, you can say you made it yourself! This pattern is in uncut, factory folded condition. Copyright 2002. 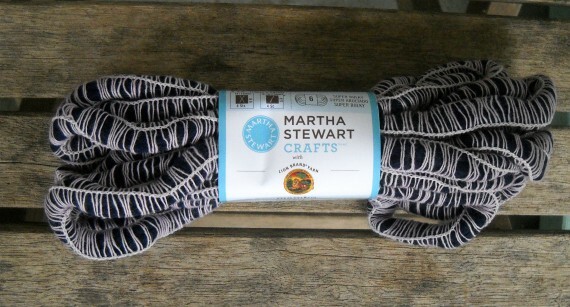 A beautiful super bulky weight (6) yarn in a gorgeous purple color. 75 percent acrylic, 7 percent wool, 9 percent nylon, 6 percent viscose, 3 percent angora. Net wt .88 oz, 25 g. 5 yards, 5 meters. Made in Italy. Hand wash cold. Dry flat. 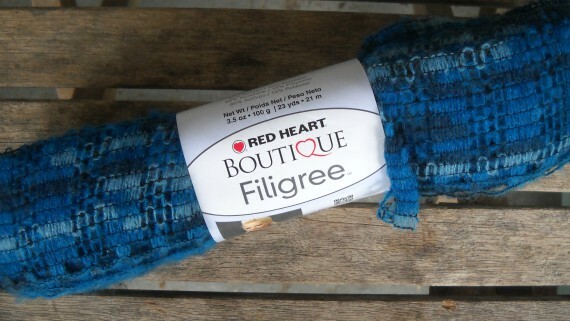 Red Heart Boutique Filigree Yarn, Color Tealy, 3.5 oz. A beautiful super bulky weight (6) yarn in a gorgeous teal blue color. Scarf pattern included as shown. 85 percent acrylic, 15 percent polyester. Net wt 3.5 oz, 100 g. 23 yards, 21 meters. Hand wash cold. Dry flat. 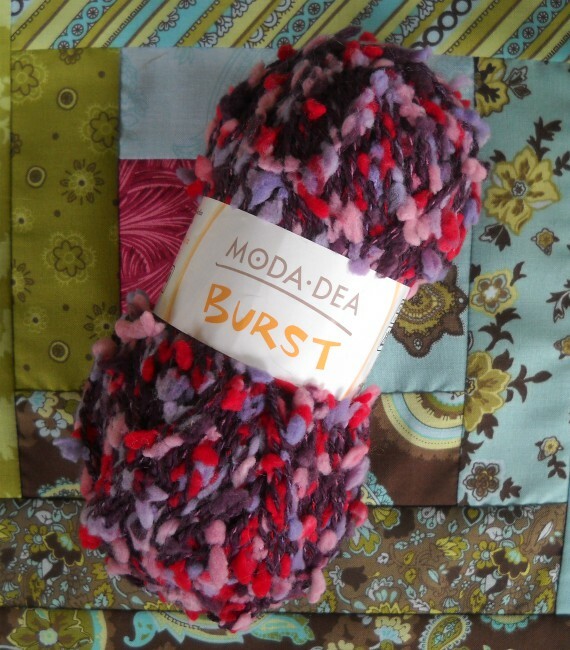 Moda-Dea Burst Yarn, Color Passion 4250, 50 grams. A beautiful medium weight (4) yarn in a purple color with fabulous pink and purple soft puffs along the length of the yarn. 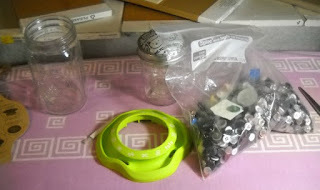 64 percent acrylic, 36 percent nylon. Net wt 50 grams, 1.76 oz. 60 meters, 65 yards. Machine wash cold. Lay flat to dry. Too many new items to list them all on this post ~ click here to visit the Curlicue Creations shop. Hello and welcome to my little corner of the Quiltmaker's 100 Blocks Volume 16 Road Rally Blog Tour. I'm so glad you've taken a few minutes out of your busy day to visit me! You are rolling your virtural "road rally" car into the beautiful countryside of Henderson, North Carolina. We're at the peak of the fall foilage this week, my favorite time of the year. I love the way the bright leaf colors pop against the gray skies. 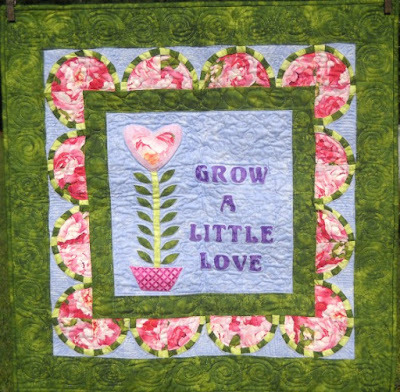 This is my block for issue 16, "Grow a Little Love". It is block #1509. 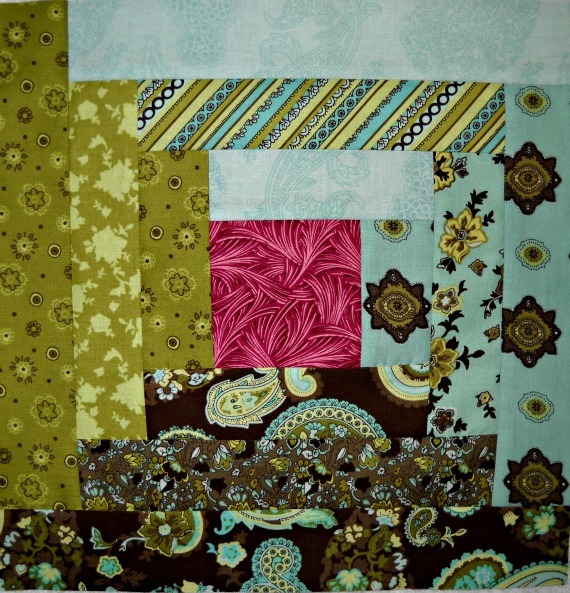 The pattern for this block appears on page 12 in the applique section of the magazine. 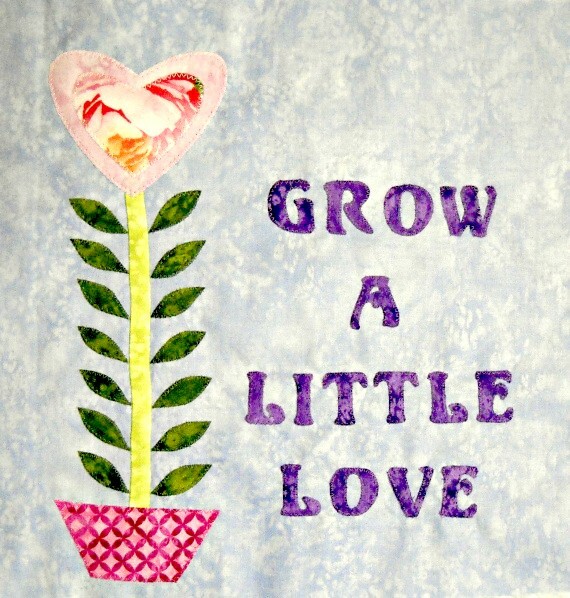 I designed and made a small wall hanging to showcase the Grow a Little Love block. 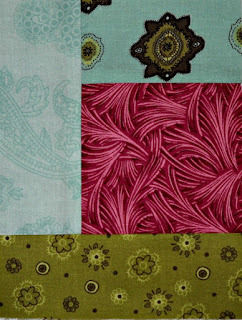 This quilt features fabrics from the Peony Passion fabric line, by Lynnea Washburn, for Northcott Fabrics. This block would make a wonderful friend gift as a wall hanging, pillow, or sew three in a row to create a cute table runner. The possibilities are endless! 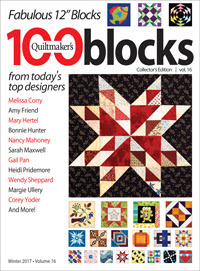 To win a copy of Quiltmaker's 100 Blocks, please leave a comment below. Let's make it interesting ~ what is your favorite flower? I look forward to reading your answers. The winner will be chosen randomly. Please be sure I have a way to contact you, if you should be the lucky winner. To return to the Road Rally Blog Tour page, click here: Quilty Pleasures. Click here to visit the Curlicue Creations shop. If you don't win a copy I will have a limited number of 100 Blocks, Volume 16 available for purchase in my shop.